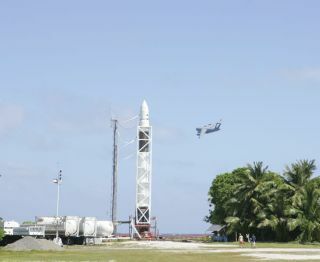 SpaceX's first Falcon 1 rocket to fly sits atop its launch pad at the U.S. Army's Ronald Reagan Ballistic Missile Defense Test Site on Kwajalein Atoll as a C-17 aircraft flies in the distance. The private launch firmSpaceX is once again ready for its spaceflight debut as its first Falcon 1rocket sits poised to launch later today. "Allsystems have passed their prelaunch checkout and we are go forlaunch," said Elon Musk, founder of the El Segundo, California-based SpaceX, Sundayin a written update. The rocket,whose inaugural flight for what SpaceX officials hope will be the first of aseries of launches in upcoming months, is slated to lift off at 2:00 p.m. EST(1900 GMT) today from a pad at the U.S. Army's Ronald Reagan Ballistic MissileDefense Test Site on Kawajalein Atoll in the Marshall Islands chain on thePacific Ocean. The planned space shot has an eight-hour window to fly, abouttwice that of a scrubbed Nov. 26 launch attempt. That launchattempt was aborteddue to a series of problems that included the loss of liquid oxygen fuel due tovent valve mistakenly left open, as well as a computer reset apparently caused bya brief power loss. SpaceXofficials said both problems have since been addressed and the rocket is again readyto launch its payload: the FalconSat 2 spacecraft built by cadets at the U.S. AirForce Academy. The$800,000 satellite is part of a project by the U.S. Air Force and the DefenseAdvanced Research Projects Agency (DARPA) to offer students practicalexperience developing spaceworthy vehicles. FalconSat 2, which is designed tostudy how the space plasma environment interacts with navigation andcommunication satellites, has been ready to fly since 2003, USAF academyofficials said. Academyspokesperson John van Winkle said that, while FalconSat 2 cadets weredisappointed by the Nov. 26 launch scrub, they understood the need. "We understandthat there are no do-overs in launches of this nature," van Winkle told SPACE.com. "And we've been waiting since January of 2003, and then were bumped for a rideon the space shuttle...so what's a few weeks, really." SpaceXofficials are slightly concerned about the potential impact of high winds fortoday's launch. Falcon 1rockets are designed to withstand winds speeds of up to 24 knots, and gusts ofabout 30 knots were recorded last week, SpaceX spokesperson Dianne Molina told SPACE.comFriday. The rocket'sextended launch window should allow launch officials some leeway to wait outany unfavorable conditions at the Kwajalein Atoll, where it will be 7:00 a.m.Local Time on Dec. 20 when the launch window opens. "It'ssupposed to look good for Monday," Molina said. "Other than [winds] we're ontarget," Molina said.